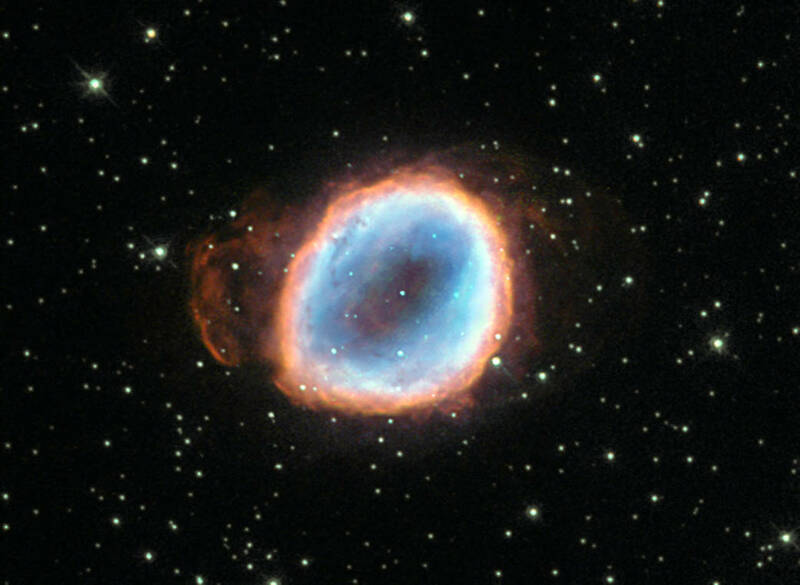 The star’s agony has culminated in a wonderful planetary nebula known as NGC 6565, a cloud of gas that was ejected from the star after strong stellar winds pushed the star’s outer layers away into space. Once enough material was ejected, the star’s luminous core was exposed, enabling its ultraviolet radiation to excite the surrounding gas to varying degrees and causing it to radiate in an attractive array of colors. These same colors can be seen in the famous and impressive Ring Nebula (heic1310), a prominent example of a nebula like this one. The system, cataloged as OGLE-2005-BLG-169, was discovered in 2005 by the Optical Gravitational Lensing Experiment (OGLE), the Microlensing Follow-Up Network (MicroFUN), and members of the Microlensing Observations in Astrophysics (MOA) collaborations — groups that search for extrasolar planets through gravitational microlensing. Self-replication is a complicated process -- DNA, the basis for life on earth today, requires a coordinated cohort of enzymes and other molecules in order to duplicate itself. Early self-replicating systems were surely more rudimentary, but their existence in the first place is still somewhat baffling. Polymers can also link together without the aid of a template, but the process is somewhat more random -- a chain that forms in one generation will not necessarily be carried over into the next. Template-assisted ligation, on the other hand, is a more faithful means of preserving information, as the polymer chains of one generation are used to build the next. 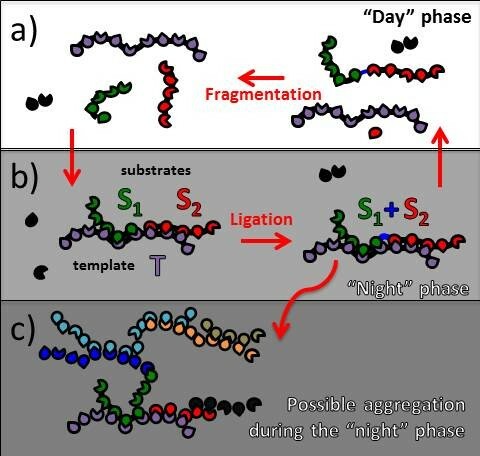 Thus, a model based on template-assisted ligation combines the lengthening of polymer chains with their replication, providing a potential mechanism for heritability. Under Tkachenko and Maslov's model, the move from monomers to polymers is a very sudden one. It's also hysteretic -- that is, it takes a very certain set of conditions to make the initial leap from monomers to self-replicating polymers, but those stringent requirements are not necessary to maintain a system of self-replicating polymers once one has leapt over the first hurdle. One limitation of the model that the researchers plan to address in future studies is its assumption that all polymer sequences are equally likely to occur. Transmission of information requires heritable variation in sequence frequencies -- certain combinations of bases code for particular proteins, which have different functions. The next step, then, is to consider a scenario in which some sequences become more common than others, allowing the system to transmit meaningful information. Maslov and Tkachenko's model fits into the currently favored RNA world hypothesis -- the belief that life on earth started with autocatalytic RNA molecules that then lead to the more stable but more complex DNA as a mode of inheritance. But because it is so general, it could be used to test any origins of life hypothesis that relies on the emergence of a simple autocatalytic system. Nearly every culture on earth has an origins story, a legend explaining its existence. We humans seem to have a deep need for an explanation of how we ended up here, on this small planet spinning through a vast universe. Scientists, too, have long searched for our origins story, trying to discern how, on a molecular scale, the earth shifted from a mess of inorganic molecules to an ordered system of life. The question is impossible to answer for certain -- there's no fossil record, and no eyewitnesses. But that hasn't stopped scientists from trying. Oparin's writing eventually inspired Harold Urey, who began to champion Oparin's proposal. Urey then caught the attention of Stanley Miller, who decided to formally test the idea. 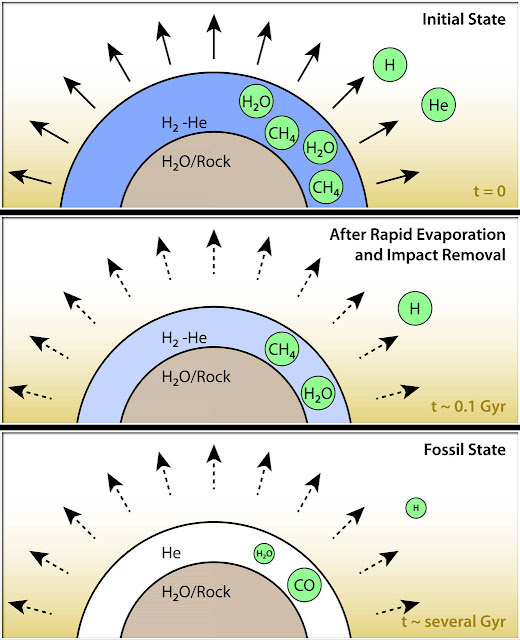 Miller took a mixture of what he believed the early earth's oceans may have contained -- a reducing mixture of methane, ammonia, hydrogen, and water -- and activated it with an electric spark. The jolt of electricity, acting like a strike of lightening, transformed nearly half of the carbon in the methane into organic compounds. One of the compounds he produced was glycine, the simplest amino acid. In the 1960s, three scientists -- Leslie Orgel, Francis Crick and Carl Woese -- independently suggested that RNA might be the missing link. Because RNA can self-replicate, it could have acted as both the genetic material and the catalyst for early life on earth. DNA, more stable but more complex, would have emerged later. Today, it is widely believed (though by no means universally accepted) that at some point in history, an RNA-based world dominated the earth. But how it got there -- and whether there was a simpler system before it -- is still up for debate. Many argue that RNA is too complicated to have been the first self-replicating system on earth, and that something simpler preceded it. Others, taken more seriously, suspect that RNA may have emerged in concert with peptides -- an RNA-peptide world, in which the two worked together to build up complexity. Biochemical studies are also providing insight into simpler nucleic acid analogs that could have preceded the familiar bases that make up RNA today. It's also possible that the earliest self-replicating systems on earth have left no trace of themselves in our current biochemical systems. We may never know, and yet, the challenge of the search seems to be part of its appeal. California's accumulated precipitation “deficit” from 2012 to 2014 shown as a percent change from the 17-year average based on TRMM multi-satellite observations. Savtchenko and his colleagues examined data from 17 years of satellite observations and 36 years of combined observations and model data to understand how precipitation has varied in California since 1979. The results were published Thursday in Journal of Geophysical Research – Atmospheres, a journal of the American Geophysical Union. 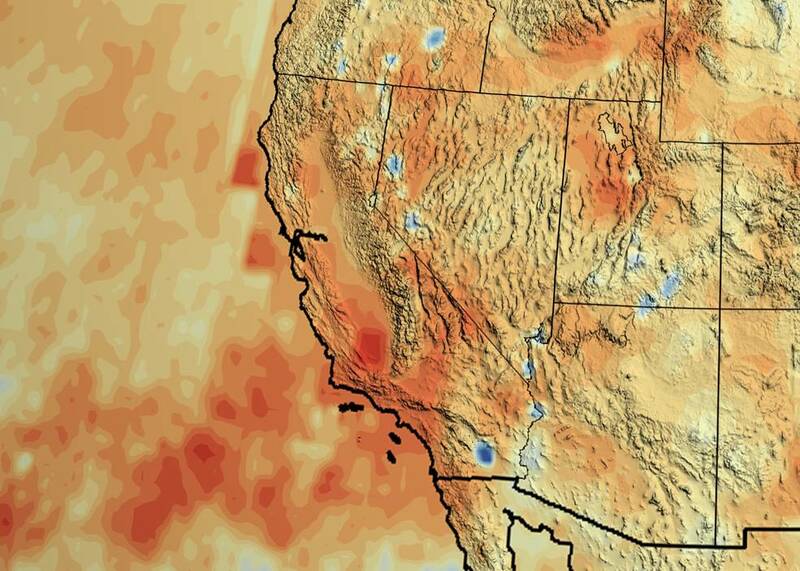 The atmospheric rivers that drenched California in December 2014 are shown in this data visualization: water vapor (white) and precipitation (red to yellow). Some of the water vapor rains out over the ocean, but the show really begins when an atmospheric river reaches land. Two reached California around Dec. 1 and 10, 2014, and brought more than three inches of rain, according to NASA's Tropical Rainfall Measuring Mission (TRMM)'s multi-satellite dataset. The inland terrain, particularly mountains, force the moist air to higher altitudes where lower pressure causes it to expand and cool. The cooler air condenses the concentrated pool of water vapor into torrential rains, or snowfall as happens over the Sierra Nevada Mountains, where water is stored in the snowpack until the spring melt just before the growing season. The current drought isn't the first for California. 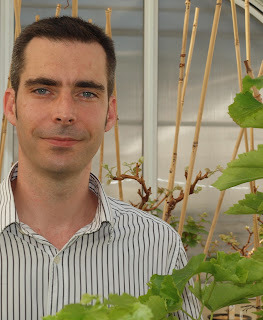 Savtchenko and his colleagues recreated a climate record for 1979 to the present using the Modern-Era Retrospective Analysis for Research and Applications, or MERRA. Their efforts show that a 27.5 inch deficit of rain and snow occurred in the state between 1986 and 1994. "Drought has happened here before. It will happen again, and some research groups have presented evidence it will happen more frequently as the planet warms," Savtchenko said. "But, even if the climate doesn’t change, are our demands for fresh water sustainable?" According to Patzert, this study added nuance to how scientists may interpret the atmospheric conditions that cause atmospheric rivers and an El Niño's capacity to bust the drought. Since March, rising sea surface temperatures in the central equatorial Pacific have indicated the formation of El Niño conditions. El Niño conditions are often associated with higher rainfall to the western United States, but it’s not guaranteed. Savtchenko and his colleagues show that El Niño contributes only six percent to California's precipitation variability and is one factor among other, more random effects that influence how much rainfall the state receives. While it’s more likely El Niño increases precipitation in California, it’s still possible it will have no, or even a drying, effect. The National Oceanic and Atmospheric Administration (NOAA), which monitors El Niño events, ranks it as the third strongest in the past 65 years for May and June. Still, it will likely take several years of higher than normal rain and snowfall to recover from the current drought. This artist's concept depicts a proposed helium-atmosphere planet called GJ 436b, which was found by Spitzer to lack in methane -- a first clue about its lack of hydrogen. 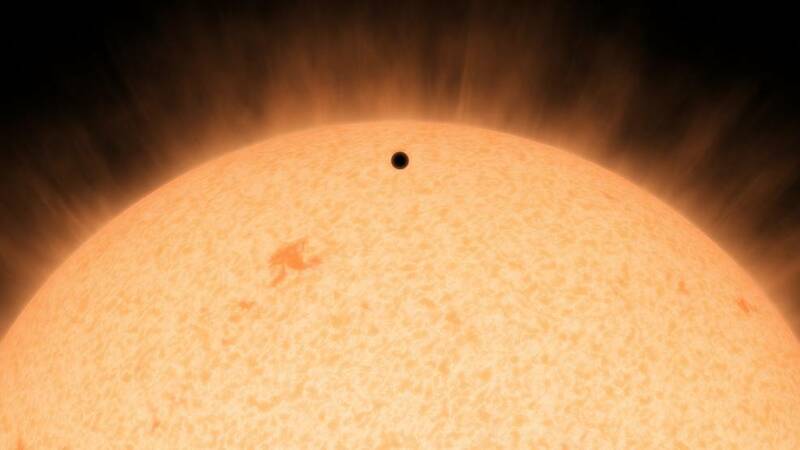 This artist's concept shows the silhouette of a rocky planet, dubbed HD 219134b. At 21 light-years away, the planet is the closest outside of our solar system that can be seen crossing, or transiting, its star. "Transiting exoplanets are worth their weight in gold because they can be extensively characterized," said Michael Werner, the project scientist for the Spitzer mission at NASA's Jet Propulsion Laboratory (JPL) in Pasadena, California. 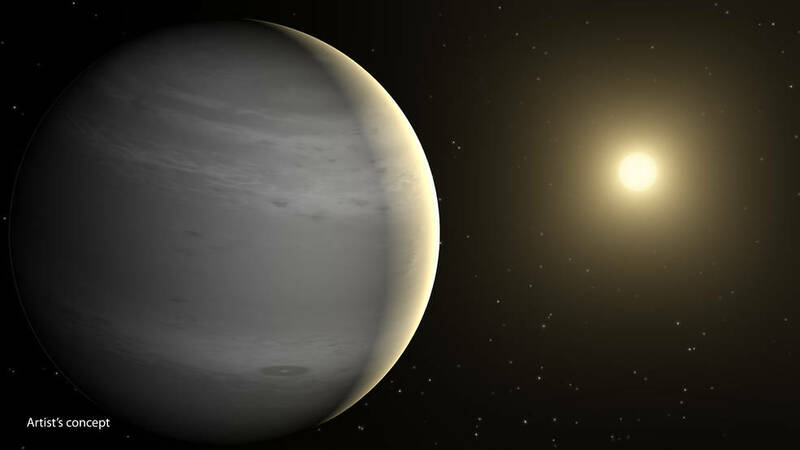 "This exoplanet will be one of the most studied for decades to come." "Webb and future large, ground-based observatories are sure to point at it and examine it in detail,” Motalebi said. JPL manages the Spitzer mission for NASA's Science Mission Directorate in Washington. Science operations are conducted at the Spitzer Science Center at the California Institute of Technology (Caltech) in Pasadena. Spacecraft operations are based at Lockheed Martin Space Systems Company in Littleton, Colorado. Data are archived at the Infrared Science Archive, housed at Caltech’s Infrared Processing and Analysis Center. The coalescence of two black holes -- a very violent and exotic event -- is one of the most sought-after observations of modern astronomy. But, as these mergers emit no light of any kind, finding such elusive events has been impossible so far. Colliding black holes do, however, release a phenomenal amount of energy as gravitational waves. The first observatories capable of directly detecting these 'gravity signals' -- ripples in the fabric of spacetime first predicted by Albert Einstein 100 years ago -- will begin observing the universe later this year. An artist's conception of a black hole binary in a heart of a quasar, with the data showing the periodic variability superposed. The sensitive new observatories potentially could detect 100 merging binary black holes per year forged in the cores of these dense star clusters. 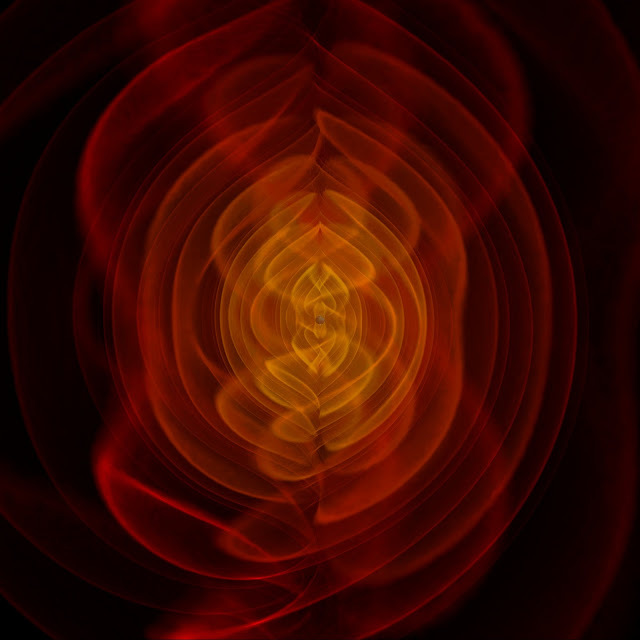 (A burst of gravitational waves is emitted whenever two black holes merge.) This number is more than five times what previous studies predicted. The study has been accepted for publication by the journal Physical Review Letters and is scheduled to be published today (July 29). Frame from a simulation of the merger of two black holes and the resulting emission of gravitational radiation (colored fields). The outer red sheets correspond directly to the outgoing gravitational radiation that one day may be detected by gravitational-wave observatories. For the study, the research team used a parallel computing code for modeling star clusters developed through a CIERA-supported interdisciplinary collaboration between Northwestern's physics and astronomy department and electrical engineering and computer science department. The title of the paper is "Binary Black Hole Mergers From Globular Clusters: Implications for Advanced LIGO." The researchers say these findings could also explain why particular plant-derived drugs used as sedatives and anti-epileptics work in humans. These drugs are able to interact with proteins in the GABA-signalling system in both plants and animals -- suggesting that future work on other plant GABA signalling agents will also benefit the medical field. 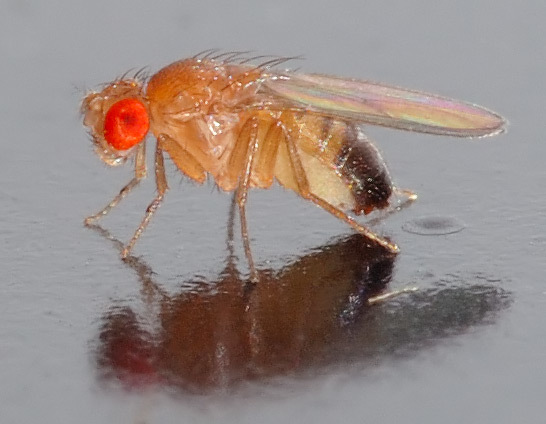 "Fruit flies are often used as model organisms to understand fundamental problems in biology," say Professor Philip Newland, Professor of Neuroscience at the University of Southampton and lead author of the study. "75 per cent of the genes that cause disease in humans are shared by fruit flies, so by studying them we can learn a lot about basic mechanisms. "Plastic can retain a charge for a long period and, given the use of plastic in the rearing of these insects and other small insects such as mosquitos, long term exposure to these fields is inevitable." The researchers put fruit flies in a Y-shaped maze, with one arm of the maze exposed to an electric charge and the other receiving none. They found that the flies avoided the charged chamber and gathered in the non-charged arm. Interestingly flies with no wings didn't display this behaviour, and flies with smaller wings only avoided higher charges - suggesting it is the wings of the fly that are involved in detection and are affected by the fields. This was borne out when subjecting stationary flies to electric fields. The researchers observed that the wings of the flies could be manipulated by a field of a similar strength to that which produced the avoidance behaviour. Professor Newland explains: "When a fly was placed underneath a negatively charged electrode, the static field forces caused elevation of the wings toward the electrode, as opposite charges were attracted. "Static electric fields are all around us but for a small insect like a fruit fly it appears these fields' electrical charges are significant enough to have an effect on their wing movement and this means they will avoid them if possible." The effect on the wings being moved seems to agitate the flies, as revealed by changes in their brain chemistry. Flies exposed to an electric field showed increased levels of octopamine (similar to noradrenaline in humans) which indicates stress and aggression. The flies also showed decreased levels of dopamine, meaning they would be more responsive to external stimuli. As well as having consequences for flies used in laboratories, the results also have implications for flies in their natural environment. "We are particularly interested in how electric fields could be used in pest control," says co-author Dr Christopher Jackson, also of Southampton. "Meshes that can generate static electric fields could be put across windows of houses or green houses to prevent insects like fruit flies or even mosquitos entering, yet allow air movement." "It also raises questions of how pollinating species like bees could be affected by power lines, which have stronger electric fields." Researchers working at the Institute for Basic Science (IBS) Center for Integrated Nanostructure Physics at Sungkyunkwan University (SKKU) in South Korea, led in part by Director Young Hee Lee, have created a high performance transistor using black phosphorus (BP) which has revealed some fascinating results. This is the atomic structure of black phosphorus and np-type transistor property of BP transistor. Silicon has to be extrinsically doped (inserting another element into its crystal structure) to make it n-type or p-type in order for it to work in a semiconductor chip. The BP crystals can operate as both n-type and p-type or something in between, but don't require extrinsic doping. 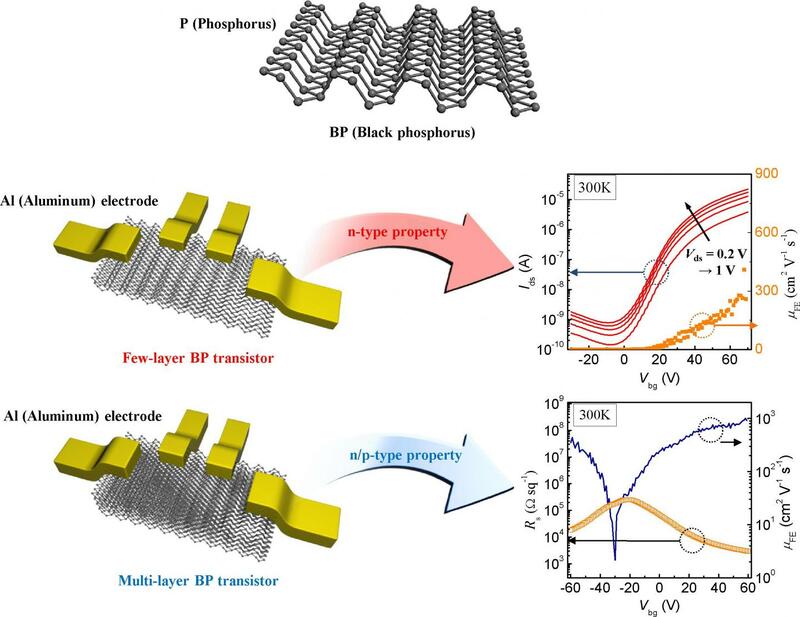 This means that instead of having to fabricate a silicon-arsenic crystal sandwiched between silicon-boron crystals, a transistor can have a single, lightweight, pure black phosphorus logic chip -- no doping required. Perello explains, "The driving force in back phosphorus is the carrier mobility. Everything centers around that. The fact that the band gap changes with thickness also gives us flexibility in circuit design. As a researcher it gives me a lot of things to play with." Unlike other industry standard semiconductor materials, there isn't a good method for making pure BP on a large scale. Currently, thin layers can be made only from scraping bulk crystalline BP samples, as no other manufacturing method exists yet. Tackling the scaling problem is already underway, with chemical vapor deposition (CVD) and other thin film growth techniques being investigated in labs across the world. The lack of a monolayer fabrication technique isn't necessarily a problem though. SKKU research fellow David Perello explains, "We can probably operate with 3, 5, or 7 layers and that might actually be better in terms of performance." When asked if BP was ready to compete with silicon today, Perello said, "I don't think it can compete with silicon at the moment, that's a dream everybody has. Silicon is cheap and plentiful and the best silicon transistors we can make have mobilities that are similar to what I was able to make in these BP devices." This doesn't mean that BP isn't worth exploring further though. According to Perello, "The fact that it was so simple to make such an excellent transistor without having access to state of the art commercial growth, fabrication and lithography facilities means that we could make it significantly better. We expect the upper bound for carrier mobility in black phosphorus to be much higher than silicon." At present, BP isn't ready for commercial use and its potential has just started to be recognized. If it continues to perform in further tests, it should be strong a contender as a chip material for future technology. Some of these craters and other features now have official names, inspired by spirits and deities relating to agriculture from a variety of cultures. The International Astronomical Union recently approved a batch of names for features on Ceres. The newly labeled features include Occator, the mysterious crater containing Ceres' brightest spots, which has a diameter of about 60 miles (90 kilometers) and a depth of about 2 miles (4 kilometers). Occator is the name of the Roman agriculture deity of harrowing, a method of leveling soil. A smaller crater with bright material, previously labeled "Spot 1," is now identified as Haulani, after the Hawaiian plant goddess. Haulani has a diameter of about 20 miles (30 kilometers). Temperature data from Dawn's visible and infrared mapping spectrometer show that this crater seems to be colder than most of the territory around it. Dantu crater, named after the Ghanaian god associated with the planting of corn, is about 75 miles (120 kilometers) across and 3 miles (5 kilometers) deep. A crater called Ezinu, after the Sumerian goddess of grain, is about the same size. 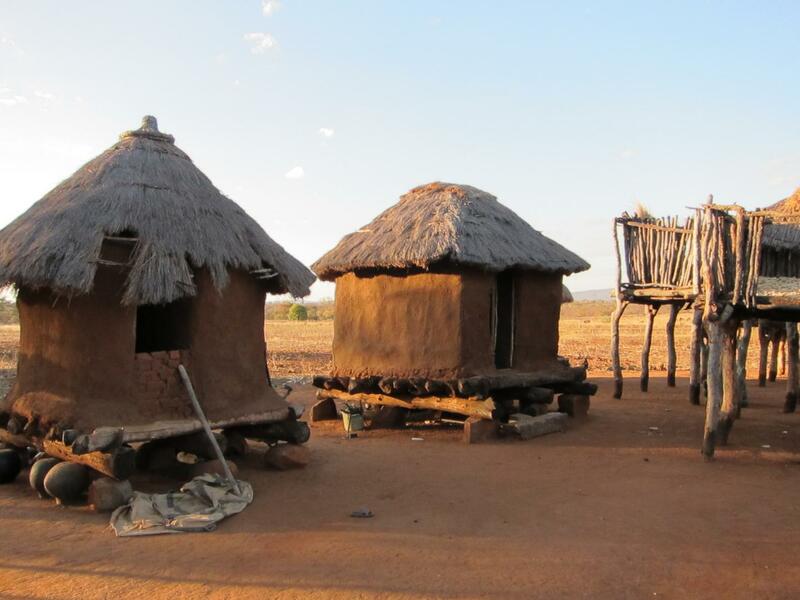 Both are less than half the size of Kerwan, named after the Hopi spirit of sprouting maize, and Yalode, a crater named after the African Dahomey goddess worshipped by women at harvest rites. This image, from Dawn's visible and infrared mapping spectrometer (VIR), highlights a bright region on Ceres known as Haulani, named after the Hawaiian plant goddess. Each row shows Ceres' surface at different wavelengths. On top is a black-and-white image; in the middle is a true-color image, and the bottom is in thermal infrared, where brighter colors represent higher temperatures and dark colors correspond to colder temperatures. The three images appear slightly flattened in the y-axis and smeared in the upper part due to the motion of the spacecraft. "The impact craters Dantu and Ezinu are extremely deep, while the much larger impact basins Kerwan and Yalode exhibit much shallower depth, indicating increasing ice mobility with crater size and age," said Ralf Jaumann, a Dawn science team member at the German Aerospace Center (DLR) in Berlin. Almost directly south of Occator is Urvara, a crater named for the Indian and Iranian deity of plants and fields. Urvara, about 100 miles (160 kilometers) wide and 3 miles (6 kilometers) deep, has a prominent central pointy peak that is 2 miles (3 kilometers) high. Dawn is currently spiraling toward its third science orbit, 900 miles (less than 1,500 kilometers) above the surface, or three times closer to Ceres than its previous orbit. The spacecraft will reach this orbit in mid-August and begin taking images and other data again. Ceres, with a diameter of 584 miles (940 kilometers), is the largest object in the main asteroid belt, located between Mars and Jupiter. This makes Ceres about 40 percent the size of Pluto, another dwarf planet, which NASA's New Horizons mission flew by earlier this month. This force, called the Yarkovsky effect, can cause rotating asteroids to drift widely over time, making it hard for scientists to predict their long-term risk to Earth. To learn more about the Yarkovsky effect, NASA is sending a spacecraft called OSIRIS-REx to the near-Earth asteroid Bennu. OSIRIS-REx will observe how Bennu’s shape, brightness, and surface features influence the strength of the Yarkovsky effect, helping scientists to better predict Bennu’s orbit over time and pin down its long-term risk. 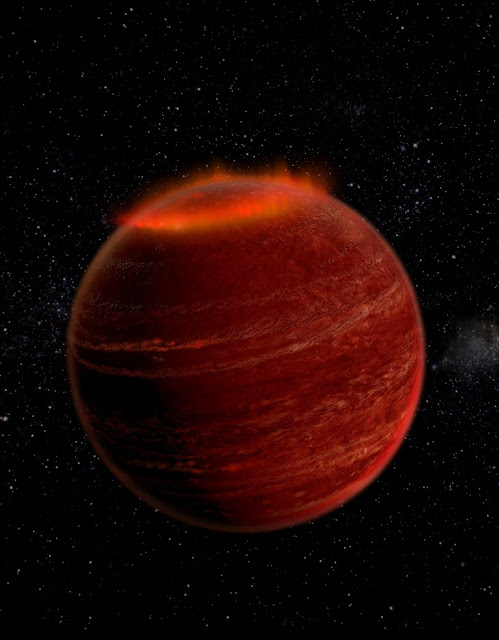 Brown dwarf stars host powerful aurora displays just like planets, astronomers have discovered. The so-called failed stars, which are difficult to detect and also remain hard to classify, are too massive to be planets but physicists from the Universities of Sheffield and Oxford have revealed that they host powerful auroras just like Earth. The international team of researchers made the discovery by observing a brown dwarf 20 light years away using both radio and optical telescopes. Their findings provide further evidence that suggests these stars act more like supersized planets. Credit: Chuck Carter and Gregg Hallinan/Caltech. Dr Stuart Littlefair, from the University of Sheffield's Department of Physics and Astronomy, said: "Brown dwarfs span the gap between stars and planets and these results are yet more evidence that we need to think of brown dwarfs as beefed-up planets, rather than "failed stars". "We already know that brown dwarfs have cloudy atmospheres - like planets - although the clouds in brown dwarfs are made of minerals that form rocks on Earth now we know brown dwarfs host powerful auroras too." He added: "Sometimes the best thing about a scientific result is simply the thrill of discovering something exciting and cool. The northern lights on Earth are one of the most spectacular and beautiful things you can see. "I've always wanted to see them, but have never got the chance. It's particularly ironic that I got to discover an auroral light show which is vastly more powerful and many light years away!" Auroral displays result when charged particles manage to enter a planet's magnetic field. Once within the magnetosphere, those particles get accelerated along the planet's magnetic field lines to the planet's poles where they collide with gas atoms in the atmosphere, producing the bright emissions associated with auroras. 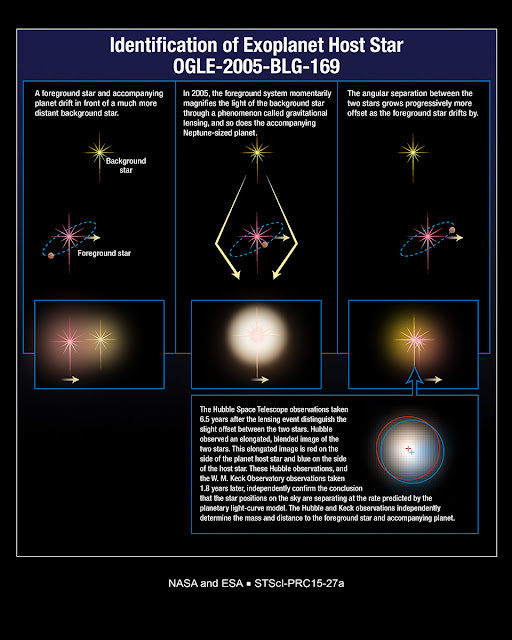 During the study the international research team, led by Professor Gregg Hallinan from the California Institute of Technology, conducted an extensive observation campaign of a brown dwarf called LSRJ1835+3259. The team used the most powerful radio telescope in the world, the National Radio Astronomy Observatory's Karl G. Jansky Very Large Array (JVLA) in New Mexico, as well as optical telescopes including Palomar's Hale Telescope and the W.M Keck Observatory's telescopes to make their ground breaking observations. The astronomers worked with the Hale Telescope and observed the brown dwarf varied optically on the same period as the radio pulses. 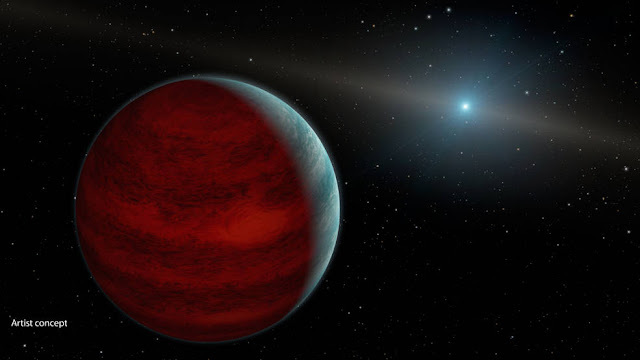 The team found that the object's brightness varied periodically, indicating that there was a bright feature on the brown dwarf's surface. Dr Garret Cotter, from the University of Oxford, who also took part in the study said: "It was incredibly exciting to track the optical light form the aurora during the night with the Hale Telescope in California, one of the most venerable telescopes in the world, while simultaneously tracking the radio emission with the JVLA, one the world's newest radio telescopes." Finally, the researchers used the Keck telescopes to precisely measure the brightness of the brown dwarf over time which was no simple feat given that these objects are extremely faint, many thousands of times fainter than our own Sun. The astronomers determined that the bright optical feature was likely to be caused by electrons hitting the hydrogen-dominated atmosphere of the brown dwarf to produce auroras. The findings from the study, published in the journal Nature offer astronomers a convenient stepping stone for further study into exoplanets, planets orbiting stars other than our own sun. Dr Cotter said: "In science, new knowledge often challenges our understanding. We know how controversial the situation was with Pluto, where astronomers had to look hard to try to decide if it is fundamentally one of the major planets of the solar system, or the first of the Kuiper Belt objects. Now, up at the other end of the size scale, we are challenged by seeing objects that traditionally would have been classified as stars, but seem to be showing more and more properties that make them look like super-sized planets." Magnetic field strength in the South Atlantic Anomaly is shown. Credit: Graphic by Michael Osadciw/University of Rochester. Modern grain bins in southern Africa, which are very similar to the grain bins found in that continent's Iron Age, are pictured. Photo by John Tarduno/University of Rochester. Radioactive aluminium (aluminium-26, or Al26) is an element that emits gamma radiation through its decay enabling astronomers to image its location in our galaxy. Studying how Al26 is created in massive stars, scientists have distinguished between previously conflicting assumptions about its rate of production by nuclear fusion. 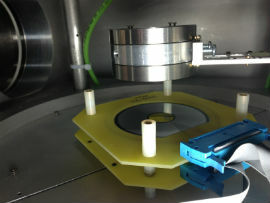 Measuring the fusion of helium and sodium at two separate particle accelerators in Canada and Denmark, the rate of production of Al26 was determined to within a factor of two. An improvement on previous experiments where there was disagreement of around a factor of 100 between measurements, this outcome removes dispute about the effect of sodium fusion on the rate of aluminium production. Al26 is known for its relatively short lifespan (in astrophysical terms), decaying in around 1 million years, compared with the lifetime of massive stars of about 19 million years. This means we are now able to better understand gamma radiation maps of the galaxy, observed by space telescopes such as INTEGRAL and COMPTEL, and deduce a more accurate picture of recent activities of massive stars in the galaxy. Evidence of Al26 decay observed in meteorites and pre-solar grains also suggests that material from massive stars contaminated the gas cloud from which the Solar System formed, providing insight into its early existence. Dr Alison Laird, Reader in the University of York’s Department of Physics and lead author on one of the two research papers, said: “This research highlights clear and unambiguous evidence from gamma-ray observations of the galaxy that nucleosynthesis is happening in stars. By pinning down the production rate of radioactive aluminium, we will be able to interpret and understand these observations. Dr Christian Diget, Lecturer in Nuclear Astrophysics in York’s Department of Physics and a lead researcher on the second research paper, said: “These two experiments, completely independent of each other at a technical level and using opposite methodology, provide the most definitive research we have to date of radioactive aluminium production. Through this, we can now much better understand where and how aluminium-26 is produced in stars, and can simulate in the lab how stars work. 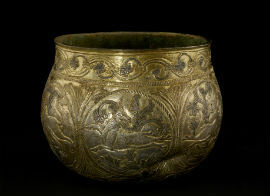 The Vale of York Cup - a Christian vessel from northern mainland Europe that was probably held by Scandinavians for some time after its capture, before finishing its life as the receptacle for a large silver hoard buried in Yorkshire. At the end of the Pleistocene period, approximately 12,800 years ago­ -- give or take a few centuries -- a cosmic impact triggered an abrupt cooling episode that earth scientists refer to as the Younger Dryas. New research by UC Santa Barbara geologist James Kennett and an international group of investigators has narrowed the date to a 100-year range, sometime between 12,835 and 12,735 years ago. The team's findings appear today in the Proceedings of the National Academy of Science. This map shows the Younger Dryas Boundary locations that provided data for the analysis. 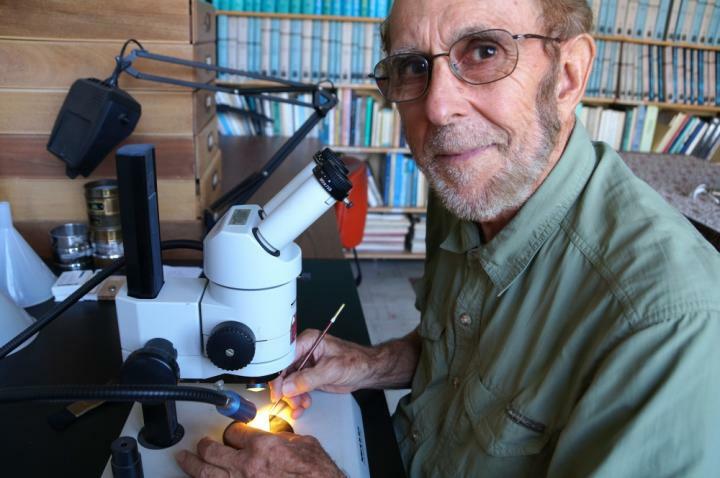 "This range overlaps with that of a platinum peak recorded in the Greenland ice sheet and of the onset of the Younger Dryas climate episode in six independent key records," explained Kennett, professor emeritus in UCSB's Department of Earth Science. "This suggests a causal connection between the impact event and the Younger Dryas cooling." "We tested this to determine if the dates for the layer in all of these sites are in the same window and statistically whether they come from the same event," Kennett said. "Our analysis shows with 95 percent probability that the dates are consistent with a single cosmic impact event." 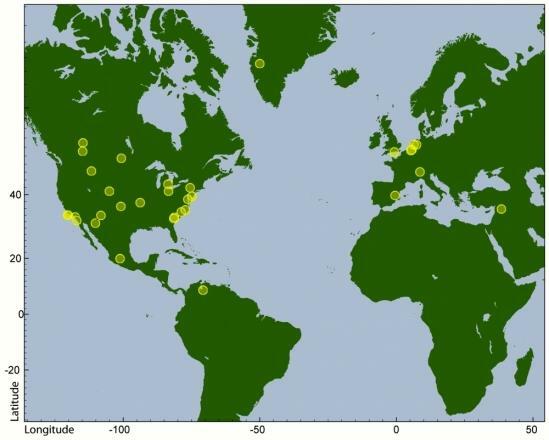 However, Kennett and his team didn't rely solely on their own data, which mostly used radiocarbon dating to determine date ranges for each site. They also examined six instances of independently derived age data that used other dating methods, in most cases counting annual layers in ice and lake sediments. "The important takeaway is that these proxy records suggest a causal connection between the YDB cosmic impact event and the Younger Dryas cooling event," Kennett said. "In other words, the impact event triggered this abrupt cooling. "The chronology is very important because there's been a long history of trying to figure out what caused this anomalous and enigmatic cooling," he added. "We suggest that this paper goes a long way to answering that question and hope that this study will inspire others to use Bayesian statistical analysis in similar kinds of studies because it's such a powerful tool." Is a Universal Flu Vaccine Close? Were Icy Comets Storks For Life On Earth? Can Solar Events Trigger Birth Defects on Earth?